It allows you to pack food that you love, that is healthy, and that you are 100% sure of the ingredients. Pinterest is brimming with healthy work lunch ideas, but what about the perfect work lunch box for adults to pack that food into? Here at Biome we have a huge range of very practical, adult friendly lunch boxes, including insulated lunch boxes, metal lunch boxes and leak proof lunch boxes. Read on as we share the benefits of each and what you might like to pack into them! A leak proof lunch box for adults is ideal as it can be stored on its side, and therefore easier to pack into your handbag or backpack to take to work. Leak proof lunch boxes generally feature a silicone seal on the lid which works to seal the lid air tight. This does however mean they are not plastic free. Our leak proof lunch boxes are 100% BPA free, phthalate free, and high quality. Such a grown up lunch box! 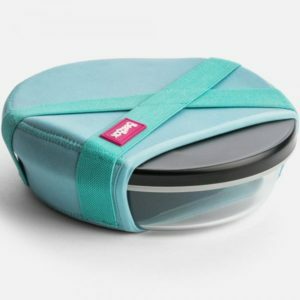 Good Design Australia award winning BeetBox lunch boxes feature a tempered and toughened lightweight glass bowl, a lightweight anodised aluminium lid, an internal stainless steel dip/dressing container, and an insulating and protective neoprene sleeve. You can see the components in the photo below. They’re stylish and very ‘adult’ looking! As the glass bowl is microwave safe (note, the lid and small stainless steel container are not microwave safe), if you would like to heat your lunch up, you don’t have to transfer it to another bowl first. 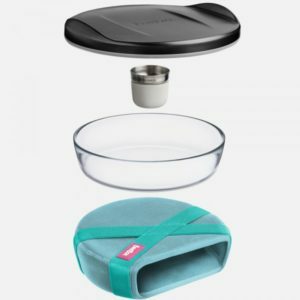 Note: BeetBox lunch boxes are only leakproof and airtight when the neoprene sleeve is correctly fitted. See the product page for details. These lunch boxes are available with and without the little stainless steel container. Beetbox are designed in Melbourne and are 100% recyclable. An insulated lunch box or food jar will keep your lunch cool or warm up until lunch time. These are a great option if you’re on the run, don’t work in an office and don’t have access to a fridge or microwave. Tip: To keep your food warm for as long as possible, pre-heat your insulated food jar by filling it with boiling water before pouring out and adding hot food. Similarly, to keep food cold for as long as possible, pop your insulated food jar in the freezer with the lid off for 15 minutes before adding your cold food. Our insulated lunch boxes for adults are also BPA free, PVC free, leak proof and easy to open. We recommend you hand wash them. 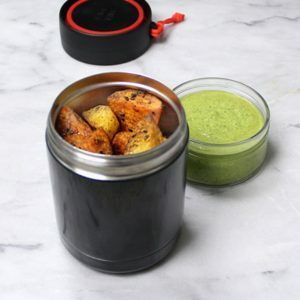 The Goodbyn 2-in-2 insulated food jar features two compartments – an insulated 470ml stainless steel compartment and a 235ml glass compartment on top. It features a wide opening for easy use and washing, and is completely recyclable at the end of its useful life. 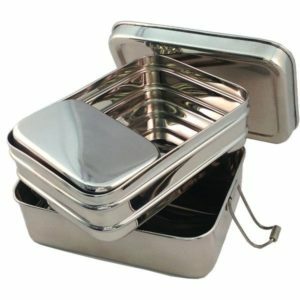 Metal lunch boxes for adults made from high quality, food grade, 18/8 stainless steel are incredibly sturdy, easy to use, easy to clean, and should last you a lifetime. If it does reach the end of its useful life, stainless steel is 100% recyclable. Metal lunch boxes won’t retain colours and smells from food like plastic lunch boxes can, and can be washed in the dishwasher. They will handle a bump or two, but may dent if dropped on a hard surface. Most metal lunch boxes are not leak proof, so are not ideal for very wet foods. Some styles have a silicone seal on the inside of the lid which does make it leakproof, however this of course means these particular styles are not plastic free. The Tuck-a-Stacker provides a roomy and versatile combination of space for you to easily pack a safe, waste free lunch. It is clever and compact, featuring two rectangle compartments that next and clip together, plus one small container to fit inside the top layer. This small container can also be used separately. Plus, the top layer can be used separately when not clipped to the bottom layer.